Day two, the route and stops taken. That’s 555 km or 322 miles with an estimated driving time of just over 6 hours. It took me about 12 hours with stops. Woke up very early, about 4:30am so decided to quietly pack up and hit the road. My original plan was to be in Port Lincoln already, but didn’t quite make it. It was still dark but about to hit sunrise so took it easy driving (kangaroo’s like to be out at dawn and dusk). NB: Clicking on the photographs will open up a full size version. First stop was Tumby Bay to watch the sun come up and have breakfast. Didn’t see the sun come up as it was quite overcast, shame really. 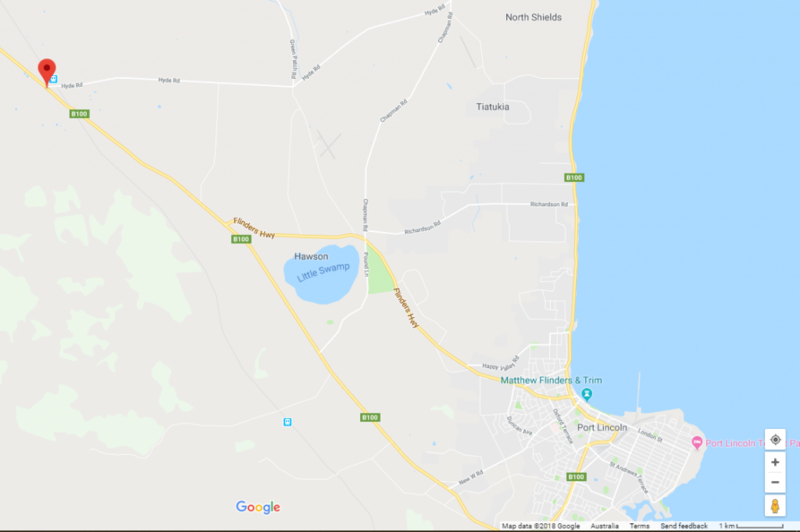 With a history dating back to 1802 when Matthew Flinders first explored the area and named it Tumby Bay after a parish in Lincolnshire England. Its name was changed for a short time (1840 to 1900) to Harvey’s Bay but was changed back to Tumby Bay by Governor Tennyson. Early settlers arrived in the 1840’s and farmed the area with wheat and sheep. 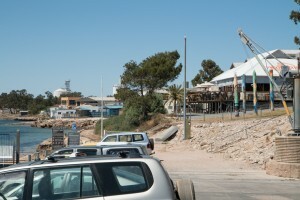 Tumby Bay population is about 1,500 people. 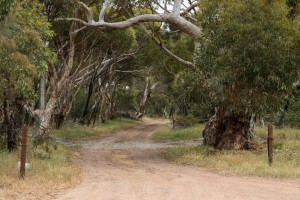 It’s about 45km north of Port Lincoln in South Australia. 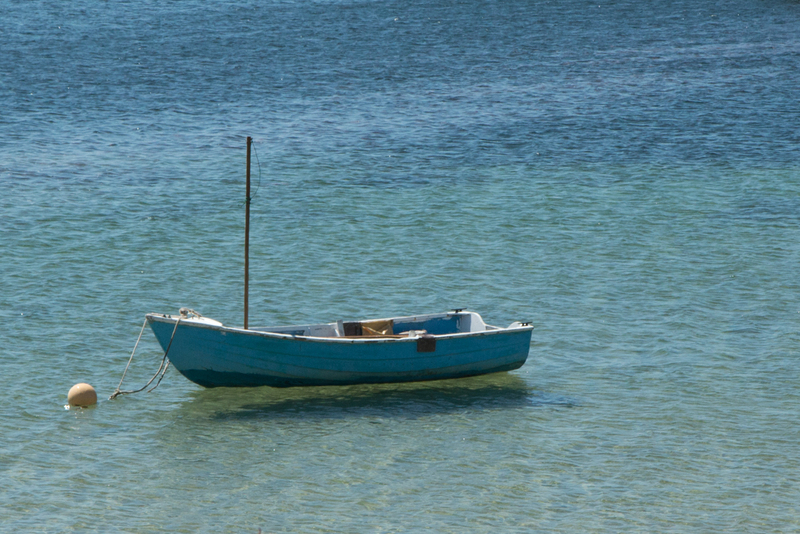 Tumby Bay is a popular tourist spot during the summer months with the main draw card being the exceptional fishing with good stocks of King George Whiting and Snapper. The beautiful white beaches and calm waters make water sports like swimming, scuba diving, snorkelling and water skiing very popular too. 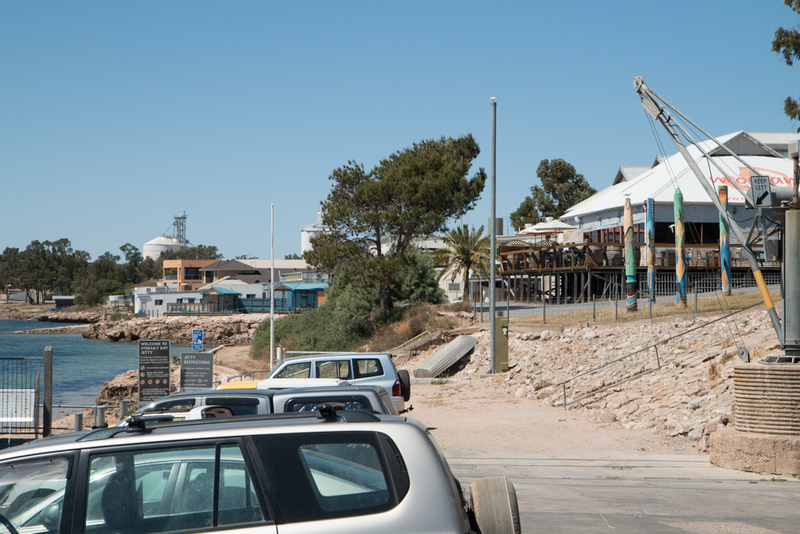 Tasman Terrace, Port Lincoln along one of the beach fronts Pt Lincoln has. Port Lincoln is quite a sizable country town with some 14,000 population. 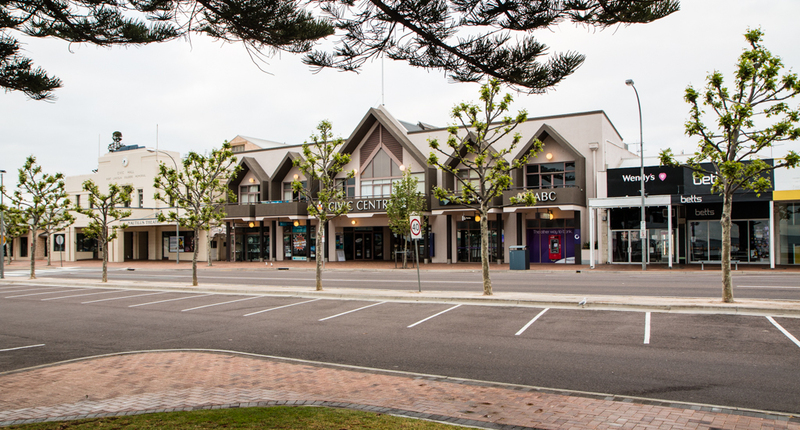 It’s a regional centre for the Eyre Peninsula. The town claims the title of “Seafood Capital of Australia”. Port Lincoln is west of Adelaide (South Australia’s capital) about 280km straight line. 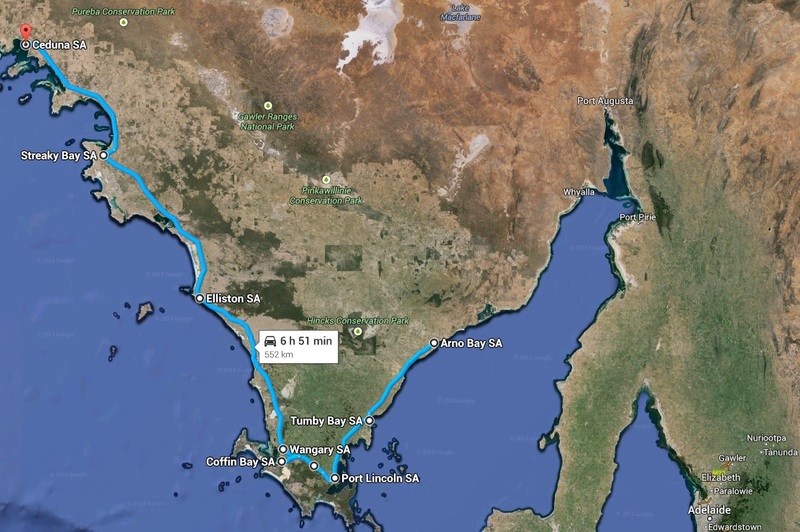 Road is about 650km as you need to go North via Pt Augusta and then south again as it’s the other side of Spencer Gulf and Gulf St Vincent. The history of the name comes from it’s original discovery by Matthew Flinders in 1802 and he named it after his birthplace, Lincoln. One of Pt Lincoln’s beaches. Bit overcast and no one around as it’s still quite early in the morning. Next stop wasn’t planned, again one of those moments where I saw a dirt road of to the right, so go have a look and see what I see. This area is called Coomunga. There is no town as such here. 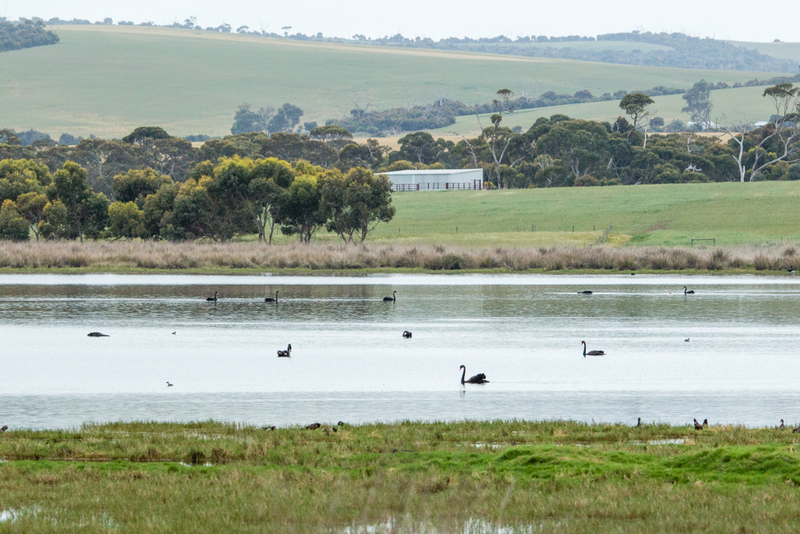 It’s an area about 15km west of Port Lincoln on the Eyre Peninsula with a number of farms. White Faced Heron which I snapped this shot of by a lake in Coomunga, South Australia. 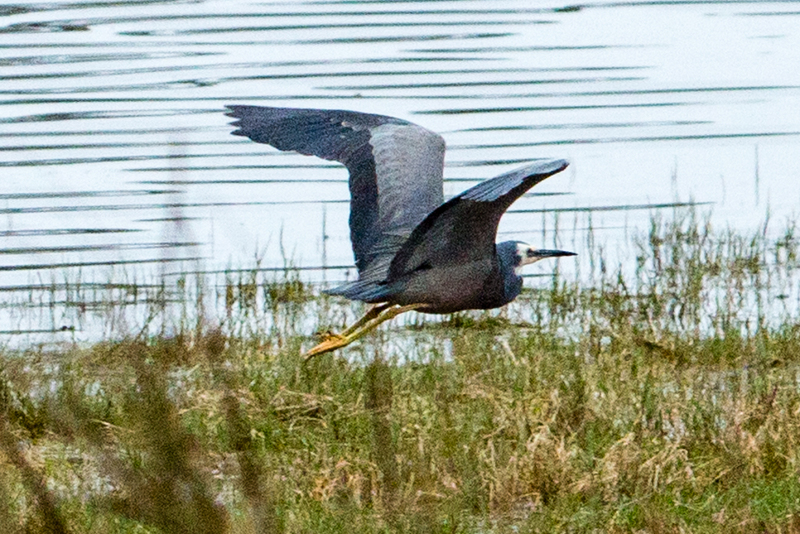 I’m pretty sure this bird is a White Faced Heron or White Fronted Heron. 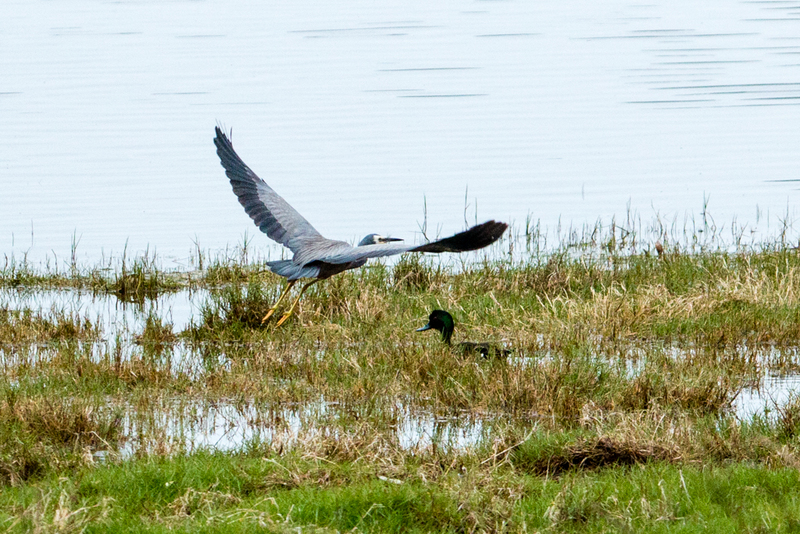 As Heron’s go, it’s quite small. 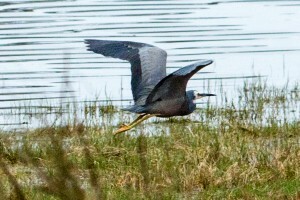 It’s blue-grey body and wings with yellow legs and a white face. They have long necks and very sharp bills allowing them to either walk very slowly or stand still for long periods in the water and as the fish comes within range, they deliver a death blow with their sharp bill and then swallow their catch whole. They also catch small reptiles and insects. White Faced Heron which I snapped this shot of by a lake in Coomunga, South Australia. Oh a cute little black duck on the left too. 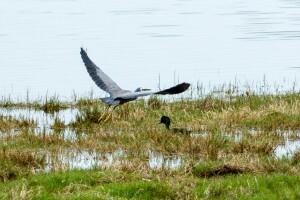 The White Faced Heron is found across much of Australasia except for the driest parts. It is local wanderer and can be found in both fresh and salty wetlands, farm dams, pastures, grasslands, crops, shores, saltmarsh, tidal mudflats, boat-harbours, beaches, golf courses, orchards or in garden fish-ponds. While prompt to depart a scene if disturbed, they are known to boldly raid suburban fish ponds for food. Coffin Bay, South Australia. Water like glass, this is just a beautiful spot. 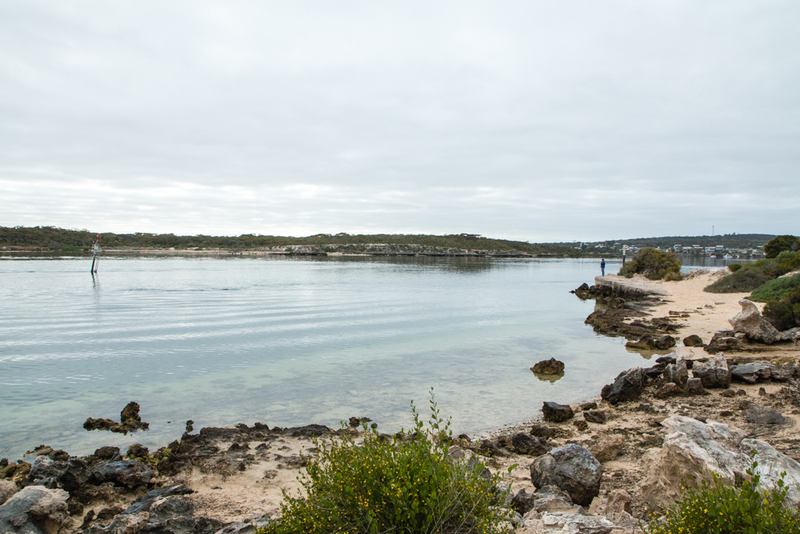 On to another really beautiful part of the Eyre Peninsula, Coffin Bay. It’s an oyster farm area with its quiet waters. 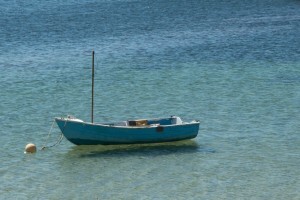 Also very popular for fishing, both boat and rock/shore. It’s quite small with a population of about 600 people. Discovered and named by Matthew Flinders in 1802 in honour of his friend Sir Isaac Coffin. Also in 1802, the French Explorer Nicolas Baudin named it Baie Delambre. The bay remained uncharted until Frederick Lees explored the area in 1839. 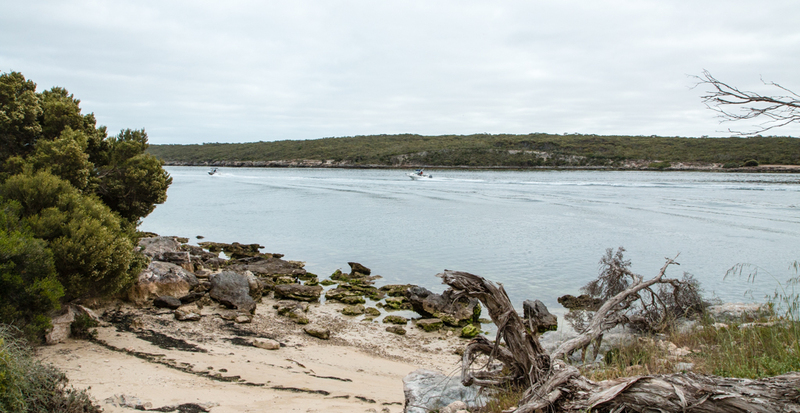 Tourism is popular through the warmer months with the main attractions being fishing of different styles including surf, angling, boat and rock. Sailing, boating, water-skiing, skin-diving, sailing, and boating are all very popular. As you can see, kayaking is another great activity in this area. Just a shame it was so overcast. Next stop was just for the view. Morning tea at a rest area in Wangary, South Australia looking over the wheat crop that is ready for harvest with the ocean in the background. Good thing, the clouds where clearing up nicely by this stage. Port Lincoln and is near to Coffin Bay. With a population of about 280 it’s quite small, but certainly has some nice beauty. flowers of red with a tint of yellow. It’s an interesting plant. 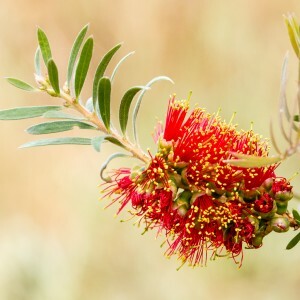 Bottlebrushes are members of the genus Callistemon and belong to the family Myrtaceae. 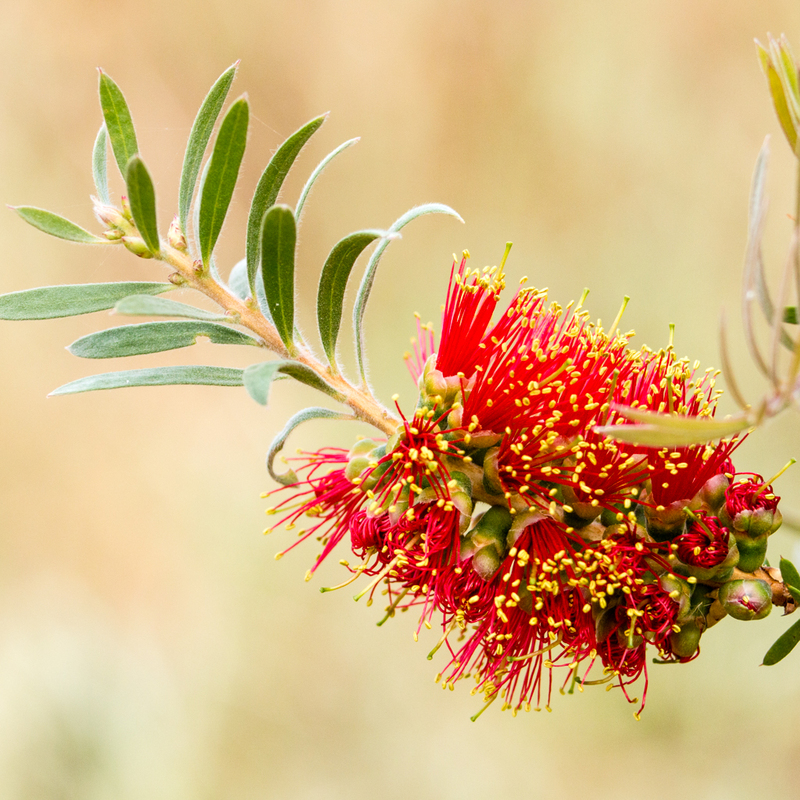 They are closely related to paperbark melaleucas, which also have ‘bottlebrush’ shaped flower spikes. It is difficult to tell to which genus some species belong. Elliston, South Australia was next. Again no idea what to expect. I came across a sign “Great Ocean Road”. Well that was my plan to do the Great Ocean Road in Victoria but weather predictions changed that so decided t check this one out instead. It was worth it! A little about Elliston. It’s a small coastal town on the west coast of Eyre Peninsula. 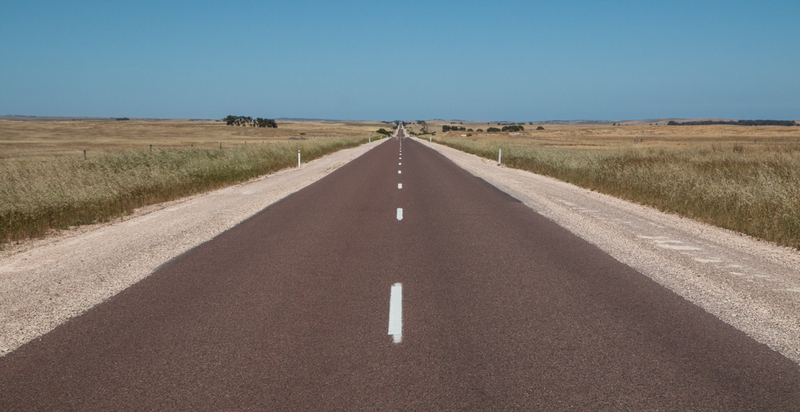 It’s 167km North West of Port Lincoln via Flinders Hwy. It has a population of about 375 so quite small. 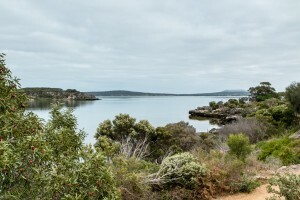 Waterloo Bay, where Elliston is located was discovered by Edward John Eyre on his journey to Western Australia from Port Lincoln in 1840 to 1841. The area was settled in the 1840’s with the town being a hub for the transportation of wool and wheat to market. A number of ships sank on the reef as they come in and out of Waterloo Bay so could be an interesting dive location too. The artist is unknown to me, but the top of the cliffs at Elliston in South Australia have quite a few interesting sculptures. Anxious Bay was named by Matthew Flinders on 21 Feb 1802 and lies between Cape Radstock and Cape Finniss. The cliff top drive to Anxious Bay offers magnificent views of the rugged cliffs and islands. You will often spot Whales, Seals and Dolphins. 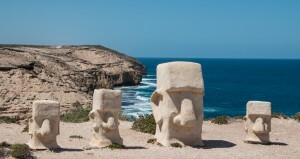 A number of sculptures are found along the top of the cliffs. Anxious Bay beach is 23km long and faces west. It has a almost 300m of surf zone. It has a few strong permanent rips that run out through gaps in rocks. Another permanent rip is against the northern headland. The only public access is at Talia or if you have a 4WD, along the beach. These are hazardous beaches and swimming is not a good idea. Fishing is popular though with the many rips. Looking down onto the beach at Elliston from the sandstone cliffs. It is a conversation park so take care. Streaky Bay foreshore with the Streaky Bay Hotel to the left, a small park, and the beach. Ok time to get a move on. Next stop, Streaky Bay. 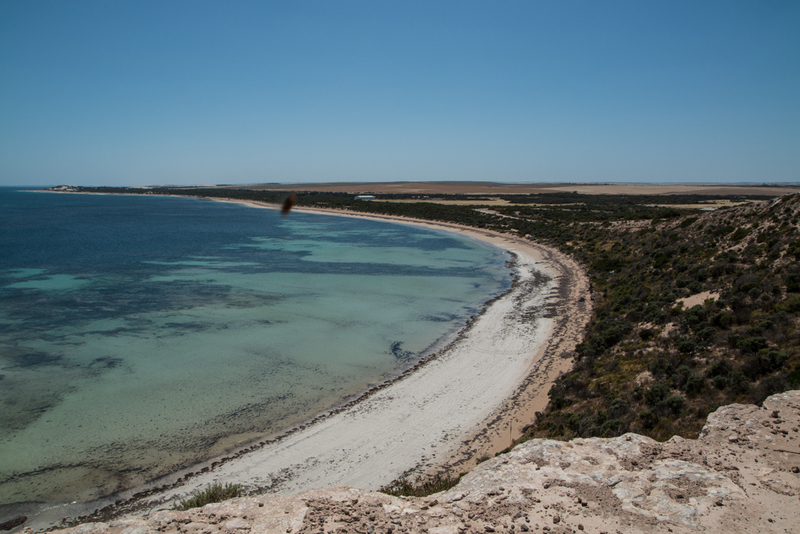 Streaky Bay was first sighted by Dutch explorer Peter Nuyts in 1627 and was rediscovered by Matthew Flinders in 1802 and named Streaky Bay. Its name comes because of the streaks he saw in the water across the bay which was caused by reflection of light and seaweed. 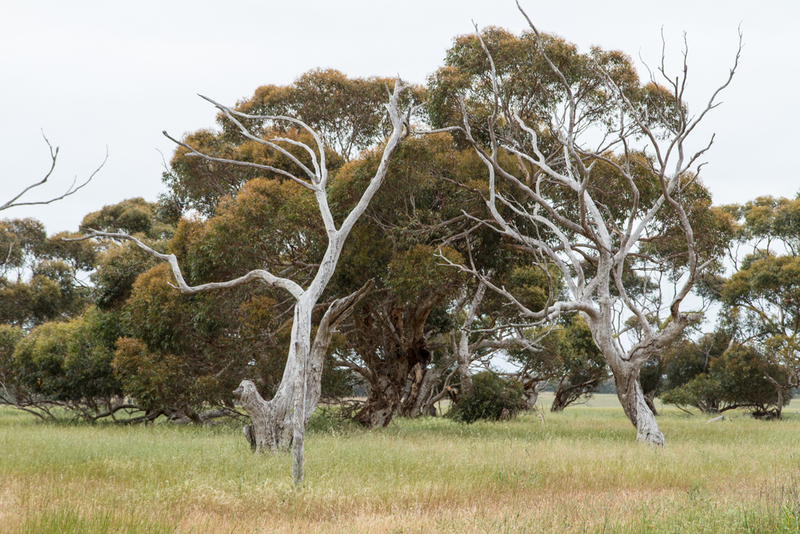 The land around Streaky Bay is predominantly pastoral when it was first started in 1854 with the biggest station in the area comprising 470 square km’s. This created the need for the town and Streaky Bay Township was born. Industries of significance are King George whiting, shark fishing, southern rock lobster, wild abalone and oyster fisheries. Streaky Bay and surrounding waters produces some of the finest quality seafood commercially for the Eastern Seaboard and International markets. 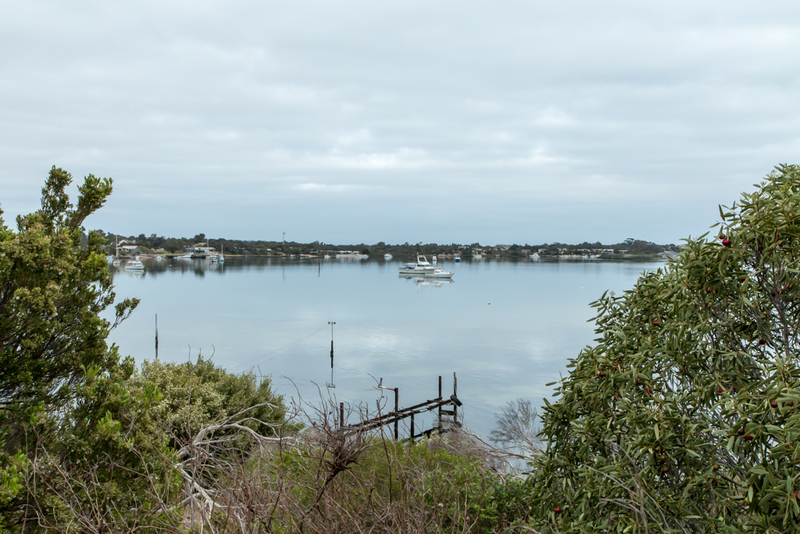 Amateur anglers and fishing enthusiasts regularly journey all year round to fish the quiet waters and scenic coastline of Streaky Bay & districts. From here, it was a drive to Ceduna. Was getting tired so was on a mission. Short stops to stretch was all I did. Tagged 4WD, Adelaide, Amateur anglers, angling, Anxious Bay, background, Baie Delambre, beach, beautiful, birds, Black Duck, Black Swan, blue-grey, Boat, boating, body, born, bottlebrush, Bottlebrushes, breakfast, calm waters, Cape Finniss, Cape Rdstock, capital, Cave, Ceduna, centre, Champions, cliff, cliffs, coastal town, coastline, Coffin Bay, commercially, Coomunga, Crystal clear water, dirt road, dirt track, districts, driving, Dutch, Eastern Seaboard, Edward John Eyre, Elliston, England, Explorer, Eyre Peninsula, Eyre Penisula, face, farm, fishing, fishing enthusiasts, flowers, Frederick Lees, French, fuel, genus Callistemon, glass, Governor, Great Ocean Road, Gulf St Vincent, Gum, Gum Trees, harvest, Harvey’s Bay, hazardous, Heron, highway, history, Industries, inner harbour, International markets, Jetty, kayaking, King George Whiting, lake, land, legs, light, Lincolnshire, location, lunch, market, Matthew Flinders, months, morning, Myrtaceae, Nicolas Baudin, ocean, overcast, oyster, oyster fisheries, panorama, paperbark melaleucas, pastoral, peninsula, Peter Nuyts, photo’s, picturesque, plan, population, Port Augusta, Port Lincoln, Pt Augusta, Pt Lincoln, red, rediscovered, reef, reflection, regional, rest stop, rips, rock, Sailing, Sandstone, sandstone sculptures, sank, scenic coasltine, scuba diving, sculptures, seafood, Seafood Capital of Australia, Seals, seaweed, settlers, shark fishing, sheep, ships, Sir Isaac Coffin, skin-diving, Snapper, snorkelling, South Australia, South Australia’s, southern rock lobster, Spencer Gulf, station, Streaky Bay, summer, surf, swamp, swinning, Talia, tank, Tasman Terrace, Tennyson, The Great Southern Ocean, Tourism, tourist, town, township, transportation, trees, Tumby Bay, Victoria, Wangary, warmer, water, water skiing, Waterloo Bay, watersports, weat, west coast, Western Australia, Whales, wheat, wheat crop, white, white beaches, White Faced Heron, White Fronted Heron, wild abalone, wings, wool, yellow. Bookmark the permalink.